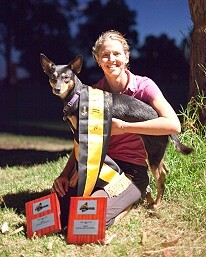 Noonbarra Massey PT, JD, AD has just been awarded Top Novice Agility Dog of the Year in South Australia. 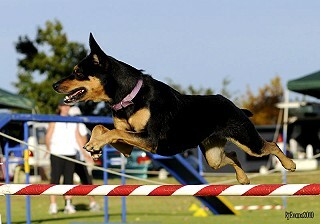 Jane wanted a nice Kelpie to participate in dog sports especially Agility. 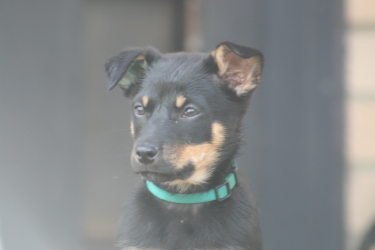 We needed a pup that would listen to commands, be agile and fast and could jump with reasonable drive. A dog with good structure. Jane also wanted a nice natured dog. Roy was wonderful at producing gentle dogs and Gemma is a sweetheart. 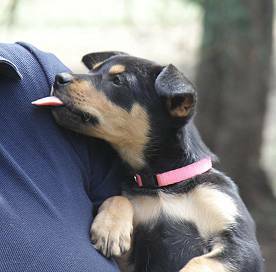 We thought this little pup would be perfect for Jane. He has 3 more trials in novice, including 2 at the Australian Nationals in the first week of May. Jumping is a different issue as he has phenomenal skills but jumps everything extended, so jumps past the next jump on occasion. We are working on developing a collected jump for just such a situation!!! I have had so many compliments since he has started trialling because he is an absolute stand out in amongst the novices around at the moment. More importantly he is very affectionate and fun loving. The only glitch we have had was just before he reached 18 months and ready to trail. He was attacked while running a sequence at club. No blood but psychologically he was a bit of a mess. I moved classes with him and he was just about over it when the same dog ran across an oval from her class and attacked him again. It has taken him a lot longer to get over this attack. The person has left the club so it can’t happen again. It was either that or I would have needed to look for another club. Luckily he associates the attack just with night time and that particular part of the oval. That’s why he has only just started trialling. He is such a sweetie that I am looking forward to booking a sister for him from you in a couple of years’ time. Thank you for breeding such lovely dogs. 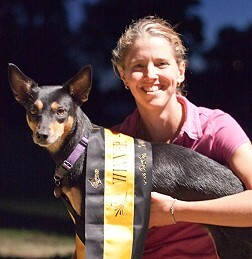 "Since emailing you Massey has just got his second Pre-Trial pass in herding and got highest PT in trial. 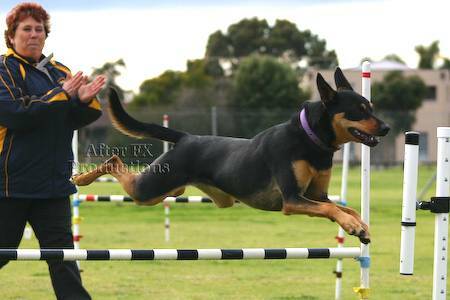 The next day he won his novice jumping class at the trial that precedes this weekend’s Australian Agility Nationals being held here in SA so he was competing against many of the dogs from all over Australia who have come early for this weekend’s trials. I am trying not to get nervous about getting into the finals as I don’t handle pressure that well!" 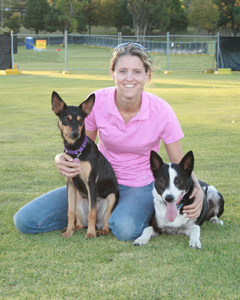 Just letting you know that Noonbarra Massey PT, JD, AD has just been awarded Top Novice Agility Dog of the Year in South Australia. He has come second in the Jumping class. He continues to do exceptionally well getting 5 passes on a recent weekend that I was not judging at, gaining 3 firsts and two seconds in open and excellent classes so I am really proud of him. He has also done well at ANKC Herding trials gaining compliments and Best in Trials as he goes. Attached are a couple of pictures of him at a recent trial. Owned by Emma Papworth. Western Australia. She is everything I had hoped for and more. 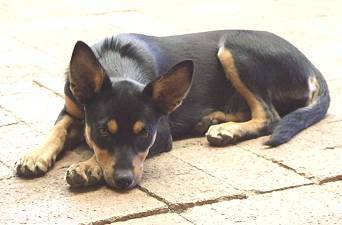 The Jackaroo/Kellie mating was an excellent choice and produced superb puppies. This is Kellie's second litter and we couldn't be happier with the quality of the pups she is producing. 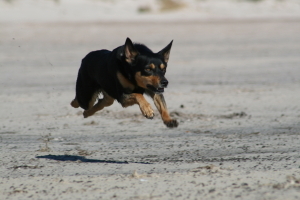 We of course have to give some credit to Jackaroo too. 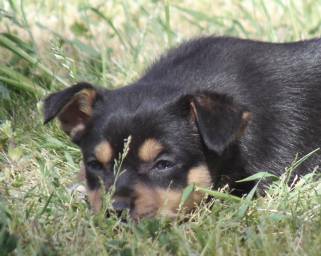 He tends to put a nice calmness into his pups and a strong faithfulness. Two top class parents! 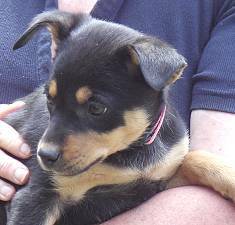 "Just a quick note to say thank you for my little girl - she is just adorable. She arrived safe and sound on Tuesday, and already I can't imagine not having her. The kids think she is just wonderful too. The first thing my 2 yr old said when she woke up from her nap today was "Nenix, Nenix". I think they are going to be great mates. It's only been a day but they definitely have a connection together already." "Just to let you know Phoenix is doing well and that she and Saxon have started playing together in the last couple of days which is really nice." I know I sent you some photos just recently but I took these couple and think they are just amazing - especially the one of Phoenix on the grass - and I knew you would appreciate them. She is such a good girl it is incredible. I have a pen outside for her which is approx 2.5m wide by about 7m long. She goes in there while the kids are running around sometimes and gets lots of praise and rewards for watching calmly. This is what she is doing in the photo, watching the kids running around. 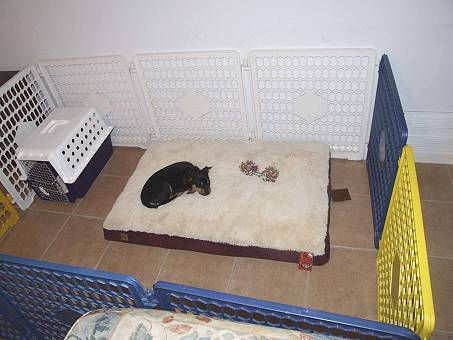 It is a great testament to you and your breeding program to have such calm puppies. Don't get me wrong she likes to have her "spacka" runs and tries to chew my shoes (while I'm walking!!) and do the regular puppy stuff. But she is so quick to pick up on what is 'right', and like you said can settle herself really nicely. She has only been here a week but she is already well and truely learning the rules and I feel like we've known each other forever already. She is only 9 weeks but I already have a good Sheepdog trainer over here wanting to meet her and help me get the most out of her. We are going to wait till she is about 4 months and then take her to see the sheep. Can't wait. 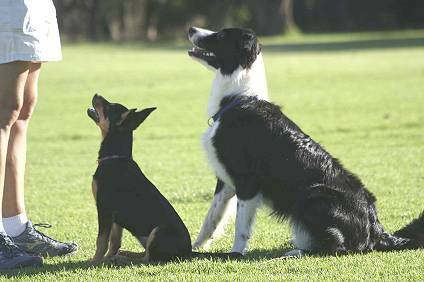 He is well aware of my intention to have her first and formost as a family pet, but that I would like to train her for Sheepdog trials as a hobby, and is happy to work with whatever I wish to do. I will keep you updated of her progress. Again, hope you like the photos, and that you are both well and Stephens treatment is helping him go from strength to strength. The biggest thing I want to say to you both is Thank you so much for my wonderful girl. She is everything I had hoped for and more. Affectionately known now as Miss Phoenix, or Nixy, she is coming along in leaps and bounds. After a couple of weeks of close monitoring and supervision, she and Saxon are now the best of mates and play so nicely together its fantastic. When I have taken one out and not the other, on returning they greet each other like they have been long lost friends who have been apart for years (very sweet). 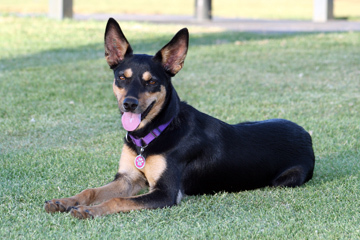 She has created a lot of interest over here in the west, with both the general public coming over to find out what "that pretty dog" is. 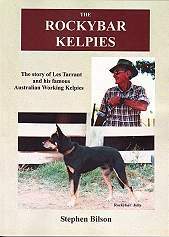 They are often quite surprised when I tell them she is a pure Kelpie, usually a discussion follows on the difference between a Working Kelpie and a show Kelpie that is what most people see. 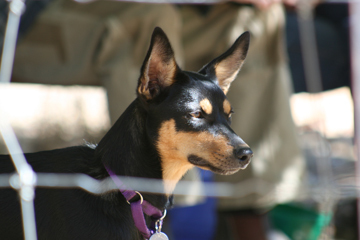 She is also very popular at Agility trials too - have to keep a close eye on her as there are a number of people there that would like to have her at their place !! Everyone seems to comment on how pretty she is (and they are right) and that she is perfectly proportioned and smart too boot. There are many people eagerly awaiting her trialling career! Her training is progressing nicely - not only at doing short bursts of heeling, she has mastered the sit and down too. Have taught her to spin and she has roll over going well also. 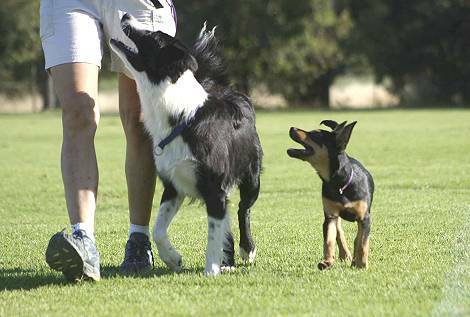 As mentioned before she has an awesome recall as I have spent a lot of time on it as I feel it is possibly the most important thing to teach a dog. Along with "leave it". She will quite happily turn away from almost anything and check back in with me when I tell her to "leave it" which also gets a lot of "wow how did you do that" from other people in her puppy class. Her attention on me is amazing for such a baby but then that also comes from a lot of time spent on it too. As you mentioned to me about her ability to settle I have continued to work strongly on that and she will happily lie down in the middle of class and relax while the instructor is talking and other dogs are jumping around!! Also if she is exited or getting frustrated at being held I can tell her to settle and she will relax and calm down which is lovely. 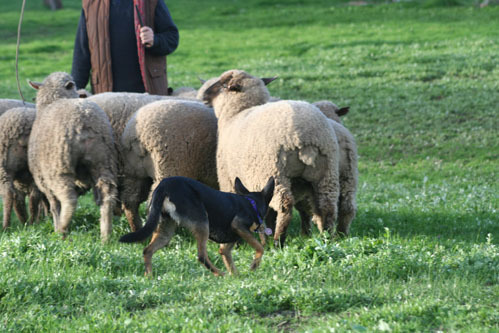 Exciting stuff today - we went and saw Simon Leaning of Marionvale Working Kelpies and Phoenix had her first run on sheep! That little puppy is amazing. Her natural ability and calmness with the sheep was brilliant. 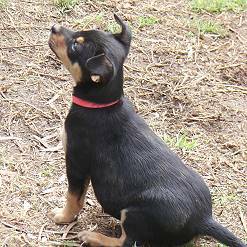 As Simon put it at the end of the session "Thats a great little pup with the potential to go far". She had three runs on 3 sheep in a round yard and stood her ground nicely with a couple of challenges the sheep put to her. She works at a good distance to keep the sheep calm but can also come in and push them to get them moving. She instinctively worked off my body language and positioning to move the sheep and we were doing quite nice figure 8's in the yard. She also got to have a run in the paddock on about 15 sheep. I put her down and she cast out a good 20 metres and collected all the sheep straight back to me. During the session a couple of sheep tried to break away but she quickly covered them and brought them back in with out losing the rest of them. Simon says she has great balance and stops on point nicely (I think that's the right terminology!). He also commented that he hasn't seen such natural ability in a pup of that age for a long time - she is very mature in her movements and has a great presence about her. After one session with her I think I am going to be spending a wee bit of money on petrol as we go to play "real working dog games" on a regular basis!! As I said to a friend who doesn't understand the whole thing - there are much worse habits that I could get addicted to. At least this way Phoenix and I are having fun, we are out in the fresh air and meeting some great people - seems pretty good to me! So I will keep you posted on the progress of "the pretty little puppy" as we venture into this world of sheepdog training. Thanks again for such a great little pup, and yes she does have her off moments too - she's not good all the time! I have had a little landscaping done, and apparently the nozzle on the end of the hose wasn't good enough because it has been chewed off never to be seen again!! Oh and she doesn't like the palm fronds falling off the trees either - they get a stern telling off until I go out and remove them from where Phoenix feels they are not supposed to be! Quite a little character that one. Again, hope all is well and I will be in touch again soon. 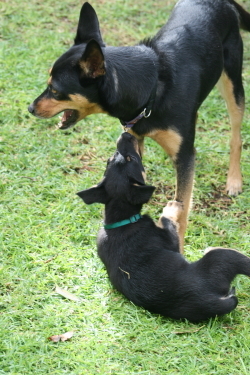 I have attached a photo of Phoenix and her BC friend Mav doing some heel work together. As well as some other recent photos of my little girl which I'm sure you will enjoy. Being in season she missed our Club Members Comp for obedience which was a shame because she is doing so well with her training. She is training at CCD level and doing some work towards higher level exercises too. She is a very fast learner and I have to be on my toes as she will try and get away with things if I'm not on the ball. I am hoping to have her ready for trialling in CD for our State Champs and then the Nationals in Oct next year. Her agility training is progressing nicely too. I've been doing lots of foundation work with her and it seems to be paying off. Age wise she will be ready for trialling for the Western Classic in Mar/Apr next year, but I am not going to rush her if she is not ready maturity wise. She was measured last weekend so I know which height to jump her. She is 46cm at the withers, so she is on the bottom end of 500 category (cut off to jump 400 was 45.5cm). Unfortunately I haven't had a lot of chances lately to get her on sheep which is a shame. However now that things are settling down a bit I will hopefully be able to get her out to do some sheep work more often - I'm not sure who misses it more, Nix or I.
Hi Again, Forgot to mention a couple of Nix's interesting things!! She prefers to sleep on top of the crate I have outside for them - even better if Saxon is inside it!!! Her favourite toys are anything hard and plastic - empty juice or water bottles. 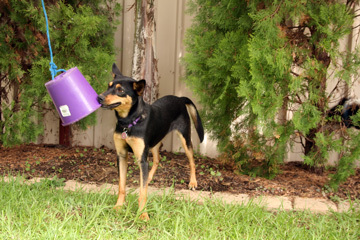 But the best toy (according to Nix) is an old pot plant container!! She will play with it for ages, throwing it around and pouncing on it. I have tied one up on a piece of rope so she can try and catch it, which I might add she does all too easily (have included a photo). 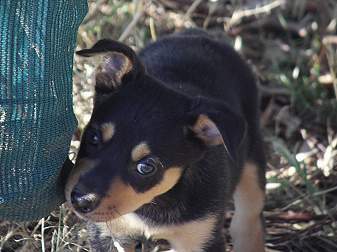 Miss Nix is growing up into a fine young Kelpie!! Although she does try my patience some days!!! Still has the sweetest nature and makes friends where ever she goes. After looking at your site again the other day, Phoenix is almost the spitting image of her Mum it is uncanny, you will see it in a couple of the photos I am sending through. I had her in our club Members Obedience comp last week. She did extremely well, we finished with the highest points but unfortunately came Second as she moved in her sit stay. Still a fantastic job though and I was very proud of her. She is up in the 'big kids' classes now which will be good. Will let you know how she goes. Went to a friends property on Sat to give her another run on sheep (this was her third time) and she did really well. These sheep were a little 'wilder' than those she has seen at Simon's but she worked them really well. I lost track of how many times I was told 'she is a really good little dog'. Still having a bit of trouble calling her off the sheep, but she is improving each time. I know the more I can get her out and do it the better she will get too. I am working towards putting her in an Encourage Trial (I think thats right!) at the end of the year. Will let you know how we go. I had a friend video Nix on the sheep from the weekend and have asked for two copies so I can send you one. Will let you know when it is on the way. Regardless of whether I breed with her or not I hope you don't mind but I will certainly be looking to you within the next couple of years for a boy. Thanks again for my girl and I will be in touch again soon with another update. I noticed you have done the Jackaroo / Kellie mating again. 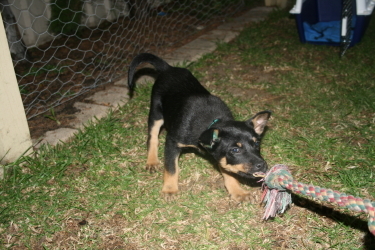 If the pups are anything like Nix you are going to have lots of happy owners. She is going very well and is just such a lovely dog. 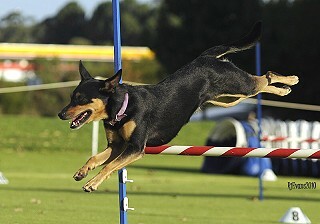 She is getting more confident and our team work is improving for our agility. She has gained a number of wins now and I am hoping for more over the next few weeks. This weekend we have the State Trials and the following weekend is full of trials leading up to the Nationals at the end of April. A big three weeks ahead. 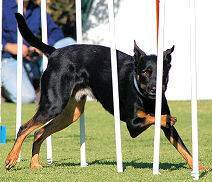 2010 : ... the weekend just gone WA had it's State Agility Trial. There was a Qualifying Trial on Fri Night and also Sat morning, followed by thte finals on Sat afternoon. 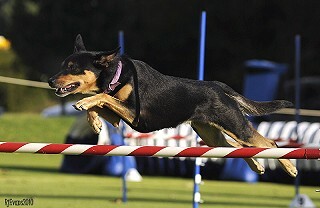 Phoenix was competing in Novice Agility and Excellent Jumping classes. Fri night she ran nicely and got a clear run and First Place in Excellent Jumping and a spot in the finals. Sat her runs were even better and she had clear rounds in both Agility & Jumping - and also managed 3rd place in Agility - plus a spot in the Agility Final. Well..... Her finals runs were great - her Excellent Jumping was the best run she had all weekend. As such Miss Nix won both her finals - I was over the moon to say the least!! I have done a huge write up with lots more detail on my blog about it and there is also some video on there too if you are interested. Nix was such a good girl!! I have attached some photos and am hoping to get a good one of Nix and her ribbons / trophies over the next couple of days which I will send through too. 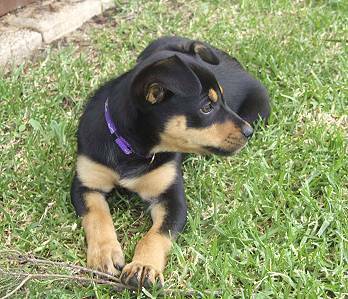 In 2009, Emma purchased another Kelpie from us. 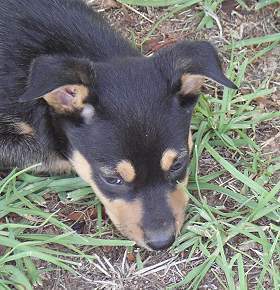 He was a very agile pup and should easily win major agility events when he matures. Just a quick email to say thank you for my boy. I think he is going to fit in just fine here!! He is sound asleep at the moment as I have just been outside playing tug with all three of them!! Phoenix is dying to play with Jetzen and Saxon keeps giving me a look that says "Mum not again!" but at the same time he is very interested in him. You were right, Jetzen is quite the character. I gave him some toys in his pen inside the house and he took all of them into his crate and then tried to drag his big bed into the crate also. He had a very puzzled look when it didn't fit. The funniest thing he has done was when I took him out to the toilet and didn't pay him any attention while I waited for him to go. He whined at me and it got no reaction, so he picked up the tug toy and I took it away (not play time), so he whined at me again, still no reaction from me, so he flopped down on his side (almost threw himself) and made a noise like his world had ended before looking at me with a cheeky look that said "Did you buy that?" - It was so funny. I still think his favourite game is playing with my son (5 1/2 yrs). They run around for hours together. It's so nice to watch. Both the big dogs have accepted Jetzen well. Phoenix is loving having someone with as much energy as her in the house. They would play for hours if I let them. Saxon has coped really well with him too. I have the three of them out in the yard together (supervised) already. Saxon has told Jetzen off a couple of times when he was getting a bit full of himself, but just like Nix it doesn't stop him from trying to win Sax over. 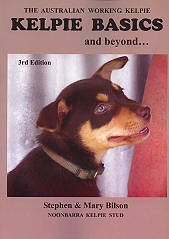 During the week I received an email from a lady in Alice Springs (Margaret Wallace) who had seen my blog and was interested in your dogs. I believe she has been in touch with you about getting a puppy next year. We have sent a few emails back and forth and she is very keen to hear all about my two and our training. If you ever get anyone interested in your dogs and they would like to hear from an existing customer then I would be happy to email and chat to them. I couldn't be happier with my guys and I think getting my dogs from you has been one of the best decisions I have made. I have got stuck into reading the books that I ordered from you also. 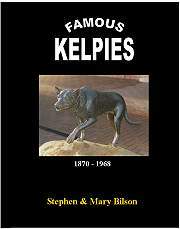 I have nearly finished reading Famous Kelpies. 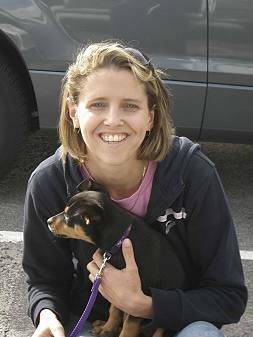 There certainly were some amazing dogs back then - and amazing people too. .. I took all the dogs to the vet yesterday for a once over - mainly for Jetzen. The vet thought Jetzen was a lovely handsome boy and Phoenix was very pretty. She was very pleased that they are in a home where they will get the mental stimulation they need too - I was pretty happy that she recognised that too. Jetzen playing with his bedding.